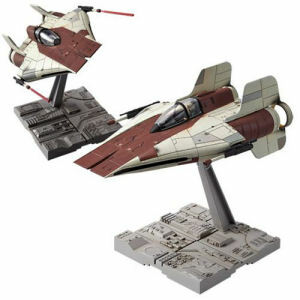 We have Just Sold out of Star Wars A-Wing Starfighter 1/72nd Scale Model Kit. This Item is unavailable at present. From the Star Wars collection by Bandai Hobby Gunpla. Star Wars A-Wing Starfighter 1/72nd Scale Model Kit. The set includes a dedicated display base - a turbolaser - 2 laser effect parts - a seated pilot(unpainted) - landing gears - 2 canopy sets. This Model does not require glue. Ages 15 and up.